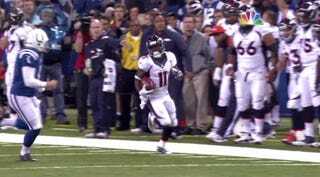 On Sunday night, Pat McAfee leveled Broncos return man Trindon Holliday. It earned him plaudits from kickers everywhere, and a "random" drug test. This week on the Indianapolis Star's "Pat McAfee Show," McAfee walked a live audience through the "the most athletic portion of my life." Poor Holliday, who was giving up eight inches and 60 pounds. But really, poor Joel Dreesen.